Bostwick Canyon Estate sits in a truly rare and exceptional setting at the foothills of Gallatin County’s picturesque Bridger Mountain Range. 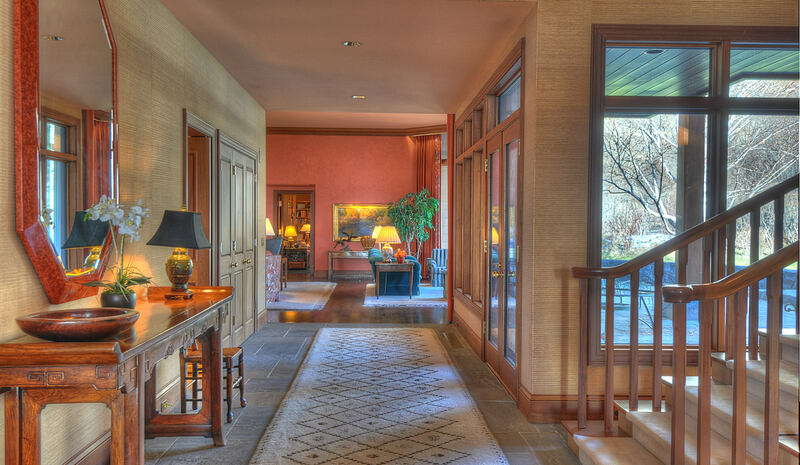 This 173± acre estate provides a stunning private mountain setting befitting the exceptional improvements. Nestled into a beautifully landscaped mountain-foothills setting, the Estate features an architecturally-designed home built with the finest of craftsmanship and materials, complete with an outdoor swimming pool, tennis court and Caretaker’s home. It is extremely rare to find an estate of this size and grandeur in the bustling Bozeman area that provides natural beauty, seclusion and privacy without being remote. With commanding views of the entire Gallatin Valley extending to the Spanish Peaks, Gallatin and Tobacco Root Mountain ranges, the Estate is only minutes from Bozeman, Belgrade and the Bozeman Yellowstone International Airport. Located in one of the Gallatin Valley’s most traditional agricultural locales, Bostwick Canyon Estate can be maintained as a very productive “gentleman’s ranch” operation. The 173± deeded acres of foothill alpine-mountain terrain includes about 30 acres of wheel-line irrigated hay meadows with the remaining acreage primarily a blend of native grasses and foothills flora such as cottonwood, aspen, dogwoods and junipers that transition into the famed Bridger Mountain Range. With good county-road access, the Estate is ideally situated for a small gentlemen’s ranch or nice-sized horse operation. The Estate possesses dramatic mountain vistas, tremendous privacy and extensive architecturally-designed improvements complemented with a sublime landscape that features the live water of Bostwick Creek and a year-round irrigation channel providing live-water ambiance. The Estate borders United States Forest Service land, which does not have a public trailhead – one of the very few drainages in the Gallatin Valley without direct public access, offering immediate private access to thousands of acres of the Gallatin National Forest’s extensive trail system. The compelling and vibrant communities of Bozeman and Belgrade are both a comfortable 15-minute drive from the Estate, almost entirely on pavement. The proximity of the Estate to outdoor recreation, cultural amenities, Yellowstone National Park, a commercial airport, private FBOs and Bridger Bowl Ski Resort make Bostwick Canyon Estate an exclusive recreation retreat for full-time or seasonal residents. Bozeman is a vibrant, active, university-oriented city steeped in culture and art. The fourth largest city in the state, Bozeman is home to Montana State University, Museum of the Rockies, and abundant opportunities for fine dining, entertainment venues and shopping. Bozeman is proud to maintain its lively downtown core by lending itself to the small-town feeling, which couples nicely with amenities typically found in larger cities. Within an hour and a half from Bozeman is Yellowstone National Park, which is easily accessible via either the north entrance in Gardiner, or the west entrance in West Yellowstone. Recently upgraded, Bozeman Yellowstone International Airport at Gallatin Field in Belgrade (BZN) offers several full service FBOs and excellent commercial services through Alaska, Allegiant, American, Delta, Frontier and United Airlines. One of the busiest passenger airports in the Pacific Northwest, and the busiest in the state of Montana, BZN offers direct flights to 17 major airports around the nation including Salt Lake City, Denver, Seattle, Minneapolis, Dallas, Atlanta, Los Angeles and New York City. The Estate is comprised of two parcels, one 81.1 acres and the other 91.8 acres, for a total of almost 173 acres. Any additional development would be determined by the Gallatin County Planning Department. Both parcels are situated in the Middle Cottonwood Zoning District. This zoning district focuses on the preservation of open space and agricultural-land uses. Specific details pertaining to this zoning district can be found on Gallatin County’s website at www.gallatin.mt.gov. Water rights out of Bostwick Creek are utilized to irrigate approximately 30 acres of hay land. All wheel-line irrigation equipment and pump would transfer at the consummation of a transaction via bill of sale. The hay pastures have historically produced about 1.5 tons of hay per acre on one cutting annually, but have been used as irrigated pasture by the neighbor for the past several years. The irrigated land is improved pasture, however a more intensive management program could certainly yield much more hay on a per-acre basis. The neighbor is interested in continuing this relationship, but this lease could be terminated or transferred at the preference of the new owner. The Estate is cross-fenced into three individual pastures, all of which have good stock water for livestock; more pastures could be added with additional fencing. The southwestern-most pasture also includes a small two-stall horse barn that has received limited use, but appears to be in good operational condition. The terrain and setting with the live water of Bostwick Creek would make an exceptional backdrop for the equestrian enthusiast. The varied ecosystem of dense alpine timber, grassy meadows and lush riparian areas offer diverse habitat for an abundance of Rocky Mountain wildlife including elk, mule deer, whitetail deer, bear, mountain lion, moose and a wide variety of birds. Bordered by large tracts of the Gallatin National Forest, Bostwick Canyon Estate is situated in the shadows of the Bridger Mountain Range. “The Bridgers” provide excellent opportunities for mountain recreation – hiking, horseback riding, mountain biking, fishing and camping just to name a few. Trout fishing in the area is legendary and anglers come from all over the world to experience the fly fishing available in Southwestern Montana and Yellowstone National Park. The list of famous rivers within an easy day trip from the Estate read like a destination-fishing guide book with the Yellowstone, Gallatin, Madison, and the spring creeks of Paradise Valley all within less than an hour. Expanding the scope just a little includes additional notable rivers such as the Jefferson, Big Hole, Ruby, Beaverhead and Missouri. The Estate would be an outstanding home base providing the devoted angler miles of rivers and streams to relish for a lifetime on a comfortable day-trip basis. An indication of this area’s world-renowned trout fishing reputation is the headquartering of the internationally-acclaimed Simms Fishing Products in Bozeman, and Winston Fly Rods in Twin Bridges. The Estate attracts a wide selection of wildlife and big game including elk, whitetail and mule deer, moose, bobcats, mountain lions, and mountain blue grouse. Exceptional alpine skiing is just minutes from the Estate at Bridger Bowl which offers ‘Cold Smoke’ snow on over 2,000 skiable acres and a 2,700-foot vertical rise. Bridger Bowl provides a wide variety of terrain including long slopes, glades, chutes and gullies. For the Nordic-ski enthusiast, Crosscut Mountain Sports Center offers over 35 kilometers of groomed Nordic skiing trails that are well suited to all ability levels. Big Sky Resort and Lone Mountain Ranch are less than 70 miles away and offer world-renowned alpine and Nordic skiing. Bozeman offers a comfortable, small-town feeling with big-city amenities that is ranked as one of the Top 10 ski towns by Skiing Magazine. 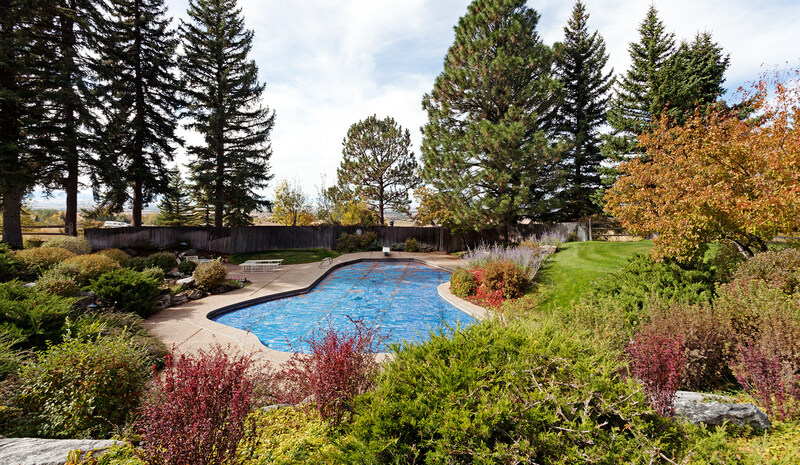 Golf and tennis enthusiasts will appreciate the proximity to Riverside Country Club, which is one of the premier private facilities in Montana for golf, racquetball sports, swimming and dining. The city offers a very diverse and active local calendar that includes music, symphony, theatre and a full slate of NCAA Division I Intercollegiate athletic events that are available at Montana State University. There are many avid fans that actively follow the MSU Bobcat teams. The next owner of the Estate will live in a number of different worlds with fishing, hunting, skiing, golf, tennis and the cultural conveniences of Bozeman so easily accessible. The center piece of Bostwick Canyon Estate is the custom-crafted and architecturally-designed 11,417 square-foot home that is perfectly complemented by a mature landscape that includes a swimming pool and tennis court in a sublime Montana mountain setting. The home was designed by locally-renowned architect Don McLaughlin, and built by craftsman Arlee Green. The exterior architecture of the home features custom cedar timbers, wide-plank cedar siding and extensive Pennsylvania blue-stone patios, pathways and walkways. The timbers were all custom hewn and milled specifically for the project from entire western red cedar trees in Port Angeles, Washington. This level of quality and craftsmanship set the stage for the custom carpentry found throughout the Estate. Complemented with perfectly matched stone chimney caps and graceful roof pitches, the home integrates seamlessly into the setting and landscape. The Estate is set back off of Bostwick Road into the foothills of Bostwick Canyon, and is accessed by a gravel driveway that serpentines through an abundant scenery of aspen, fir, cedar and spruce trees beautifully accented by manicured perennial flowerbeds and a wide variety of flowering shrubs. This setting provides an unparalleled living experience with exceptional privacy, recreation, views and nature. Covered patio space wraps around to the western part of the house providing an uplifting setting for the breakfast nook overlooking the pool and mature landscape with distant views of the Spanish Peaks and Tobacco Root Mountain ranges. It is certainly an outdoor-living space to be cherished, embraced and enjoyed. 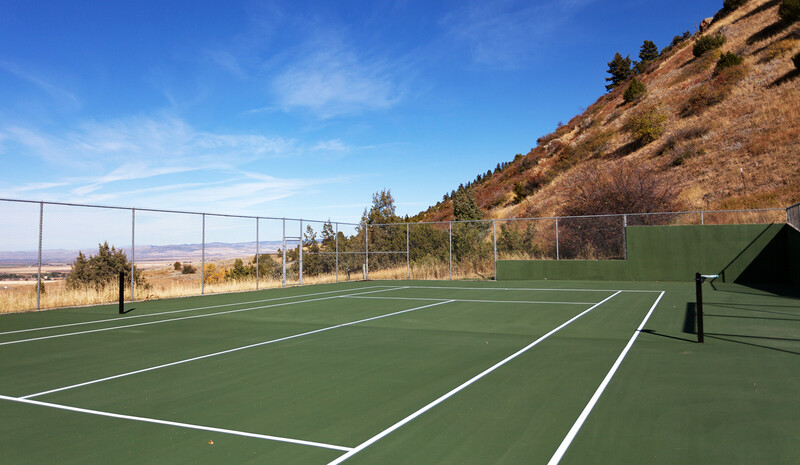 Walking across the beautifully manicured and landscaped yard to the private tennis court nestled into the foothills of the Bridger Mountains provides an incredible tennis venue with sweeping vistas of the Gallatin Valley and surrounding mountain ranges. The home has a magnificent foyer with an 18 foot vaulted ceiling, beautiful brass chandelier and a wraparound staircase featuring a beautiful custom mahogany handrail that leads to the upper level guest suites. The banister has provided opportunities for several generations of both the young and the young at heart to slide down. The upper level of the home includes three spacious bedrooms, two full bathrooms and a comfortable and roomy sitting area. One of the bedrooms has been utilized as an upper-level office that looks out over the patio and landscape below. Two bedrooms have their own private balconies, one has a beautifully finished built-in window seat, and all have expansive closets. Both bathrooms are nicely appointed with marble counters, double sinks, full tubs and standing showers. 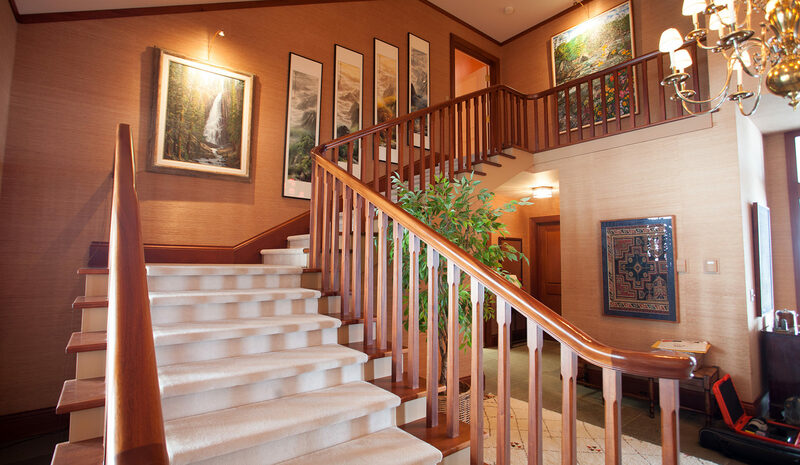 The upper level is fully carpeted with the exception of the bathrooms that have wood flooring. The kitchen, off the entry of the home, has a breakfast nook and TV area with a wood-burning fireplace with a hearth created with Mexican-tile accents. The southwestern-designed kitchen entails hardwood floors, exposed natural timbers and butcher-block counters that have been utilized as cutting blocks. Kitchen appliances include side-by-side GE Monogram refrigerator/freezer, two ovens, two warming drawers, a gas cooktop with custom copper vent hood, work sink, prep sink, an indoor grill by Jen Air, trash compactor and over-under dish-drawer dishwasher. The kitchen is a very functional and well laid out with excellent access to the covered patios, and has been used as the hub of family activity for many decades. The great room spans the entire length of the home from east to west with massive windows that complement the dramatic 13 foot ceilings and offer expansive views of Bostwick Canyon to the east, and overlook the pool, grounds and tennis court to the west. 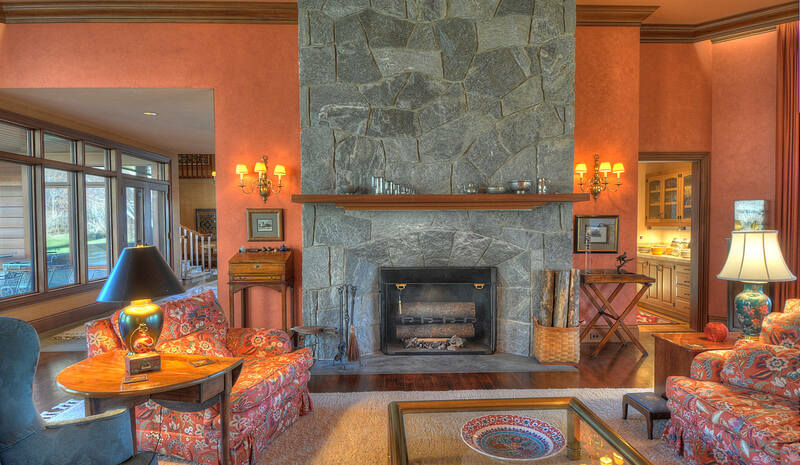 At one end of the great room, near the large circular dining-room table, is a large wood-burning fireplace made of Gallatin Canyon Gneiss stone with a stone mantle and a custom fire rack that allows whole logs to be fed on a continuous basis. Off the great room, there is a library with built-in bookshelves that wrap around the entire room and a wood-burning fireplace. The library is a private space with great views of the backyard looking towards Bostwick Canyon. The full carpet and double door create a very private and quiet space for work, reading and TV watching. The spacious master bedroom has beautiful windows that look out to the swimming pool and capture the views to the west of the Tobacco Roots and Spanish Peaks. The extensive master bathroom has two vanities with sinks, two closets with built-in cabinetry, a separate toilet room, soaking tub, fully-tiled shower with two heads, and a seating area. Near the master bedroom is an additional bedroom with a custom dinosaur-themed built-in cubby bed for the younger kids or grandkids, as well as another detached full bathroom. The main level is complete with an attached four-car garage that includes a workshop and gardening room that leads into the home through a large mudroom that includes a full laundry area and extensive built-in cabinetry and wine closet. The lower level of the home is set up as a center for recreation with a piano, pool table, his and hers changing rooms for the pool, and large home theatre with dark mahogany siding, leather couches, movie chairs and high-end electronics featuring a Runco projection system. The home is equipped with an elevator, that provide access to all three levels of the home for those challenged by stairs, and the ability to move larger items into the expansive lower-level storage rooms. The one-story caretaker’s house is comfortable, but modest in scale and scope with two bedrooms, a full bathroom, office, kitchen and open living room with a large stone fireplace. The detached oversized two-car garage with a concrete floor, has a work bench and storage racks. Two outbuildings are utilized for equipment storage, lawn mowers and yard tools. One building, primarily used as a gardening shed has three roll-up doors and a concrete floor. The second building has a double door onto a concrete pad, and the balance is open and offers pole-barn type storage. A small two-stall horse barn, situated southwest of the manager’s house, is in serviceable condition but will likely require updating for an equestrian enthusiast. The horse barn is accessed by a bridge that crosses Bostwick Creek and is tucked into a beautiful landscape of native junipers, aspen and cottonwood trees along the creek. Bostwick Creek flows on a year-round basis and has a population of native fish, not a fishery, rather just a very nice live water component for riparian ambiance and stock water. The setting and views from the horse barn are stunning. The panoramic perspective of the Hyalite, Spanish Peaks and Tobacco Root mountain ranges are framed in the foreground by native junipers and aspen trees as the creek tumbles out of the Gallatin National Forest to the west. Electricity and natural gas is provided by NorthWestern Energy. Internet and television service are provided via satellite, and telephone service is available through Centurylink. The Sellers hereby make known that there may be variations between the deeded property lines and the location of the existing fence boundary lines on Bostwick Canyon Estate. The Sellers make no warranties with regard to the location of the fence lines in relationship to the deeded property lines, nor do the Sellers make any warranties or representations with regard to specific acreage within the fenced property lines. The Sellers are selling Bostwick Canyon Estate in its “as is-where is” condition which includes the location of the fences as they now exist. Boundaries shown on any accompanying maps are approximate. The maps are not to scale and are for visual aid only. The accuracy of the maps and information portrayed thereon is not guaranteed nor warranted. The real estate taxes for 2017 for both parcels combined were $19,109.83. Typically, one CFS (cubic foot-per-second = 448.8 gallons per minute) is required to irrigate 40 acres of land. All water rights in Montana are subject to eventual re-adjudication by the Montana Water Court and, as a result of that process, may be changed as to validity, amount, priority date, place of use and other such changes as the Court determines. This water district is currently under the Preliminary-Temporary Decree as classified by the Department of Natural Resources and Conservation (DNRC). The Seller has made all of the filings currently required and will transfer the water rights as they currently stand with no warranty of future viability. All water rights appurtenant to and for the benefit of the Estate will be conveyed to the Buyer at closing of a sale. The Sellers will convey with the Bostwick Canyon Estate all of whatever mineral, oil, gas, geo-thermal, hydro-carbon and gravel rights which they actually own, subject to reservations by previous owners. They make no representation as to the quantity or quality of any mineral or other subsurface rights appurtenant to the Estate. The Estate sits between 4,755’ and 4,865’ above sea level. July and August are quite comfortable with average highs of 75 degrees Fahrenheit and evening lows around 40 degrees. Indian summer can linger until mid-October. December and January bring highs of approximately 31 degrees with lows around 7 degrees. Spring arrives in May in the Gallatin Valley with about one third of the annual average precipitation of 18 to 24 inches accumulating during May and June. Long before Lewis and Clark arrived in the Gallatin Valley, the Native Americans referred to it as “The Valley of Flowers”, a result of the right mix of moisture and sunshine producing gorgeous flowers. The valley’s name is derived from the Gallatin River, so-named by Lewis and Clark to honor President Thomas Jefferson’s Secretary of the Treasury, Albert Gallatin. Although Mr. Gallatin is the namesake for this world-class river, its fertile valley and magnificent mountain range, the honorable statesman never had opportunity to visit our nation’s frontiers. Foreign service took him to Europe, not out West to explore mountains and prairies. However, because of his interest in conservation, he was a worthy namesake for this abundantly beautiful area. Early Europeans may have entered the Gallatin Valley in the late 1700s as they trapped for beaver pelts to send back east for hats and coats. Lewis and Clark’s Corps of Discovery left the first written descriptions of the valley in both 1805 and 1806 during their epic journey. 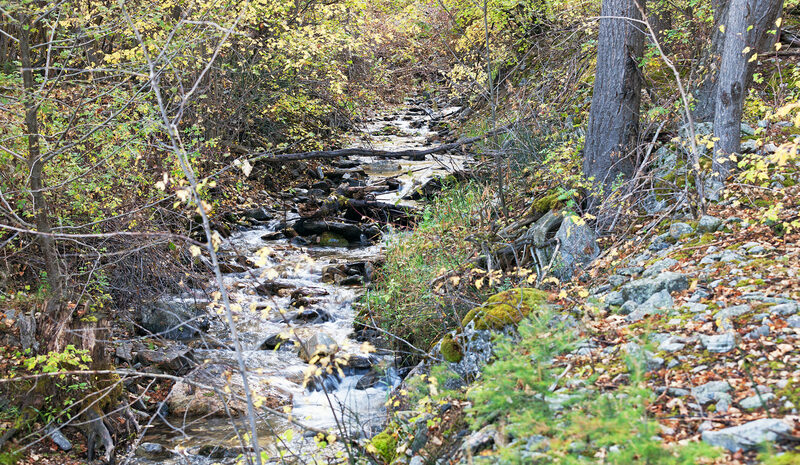 A gentleman from Georgia named John Bozeman was looking for gold and established the Bozeman Trail as a short-cut connecting the Oregon Trail to the gold rush Territory of Montana. Many followed this trail for gold but stayed in the valley to take up farming and business. Bozeman was incorporated in 1883 and grew steadily, reaching a population of 3,500 by 1900. Bozeman is now one of the fastest growing micropolitan cities in the nation with a population in 2018 of 47,500 – not including approximately 16,000 full-time students at Montana State University, and the rapidly growing and developing greater Gallatin Valley that exceeds 100,000 people. Bostwick Canyon Estate enjoys a premier location in the Gallatin Valley – one of Montana’s most desirable locales – that provides an exceptionally beautiful and private setting, and is graced by stunning views and abundant recreational resources. This unique gem contains about 173 acres of land with exceptionally-designed and custom-crafted improvements, water rights that provide irrigated production, in a setting ideal for a recreational retreat or equestrian operation. This attractive holding has bona fide potential for placement of a conservation easement, with all of the satisfaction and tax advantages associated with such a decision. Any one of the viable conservation organizations will be enthused and very helpful in helping to structure a proper easement on the Bostwick Canyon Estate should this concept appeal to the next fortunate owner. The compelling and vibrant communities of Bozeman and Belgrade are both a comfortable 15-minute drive from the Estate, almost entirely on pavement. 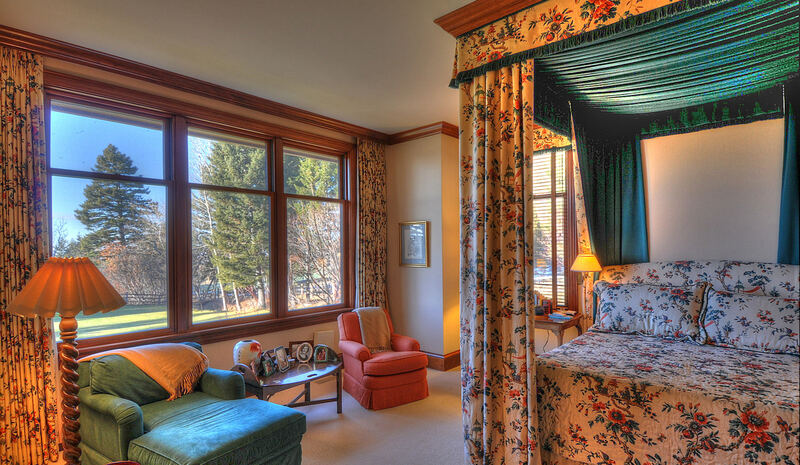 The proximity to outdoor recreation, cultural amenities, Yellowstone National Park, a commercial airport, private FBOs and Bridger Bowl Ski Resort make Bostwick Canyon Estate an all-season recreation retreat for full time or seasonal residents. Complete with good irrigation water rights, exceptional improvements, extraordinary views and a stunning private setting, Bostwick Canyon Estate is a legacy opportunity available for first time in over 50 years in the highly desired Gallatin Valley and Bozeman market. Buyers’ Brokers are welcomed and invited to contact Mike Swan or Tim Anderson in our Bozeman Office for information regarding Cooperation Policies. This entire Offering is subject to errors, omissions, prior sale, change or withdrawal without notice and approval of purchase by the Seller. Information regarding land classifications, acreages, carrying capacities, crop yields, potential profits, etc., are intended only as general guidelines and have been obtained from sources deemed reliable; however, accuracy is not warranted or guaranteed by the Seller or Swan Land Company. Prospective Buyers should verify all information to their sole and complete satisfaction.Swan Land Company has been authorized by the Seller to act as their Exclusive Real Estate Broker on the sale of Bostwick Canyon Estate. 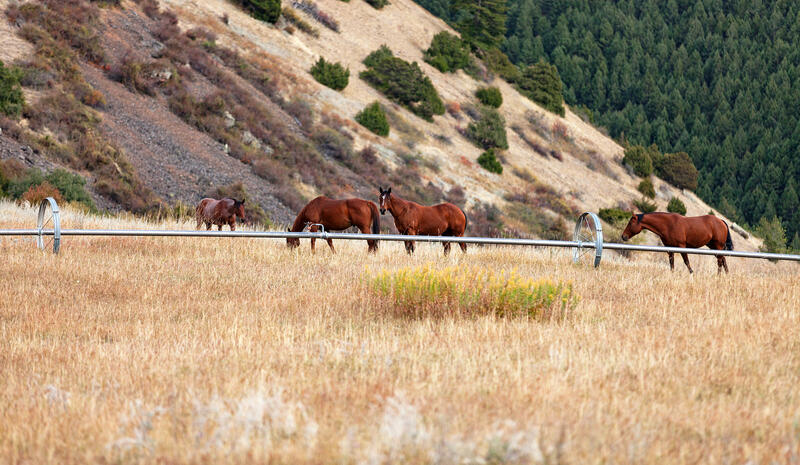 Since 2002, we have primarily focused on the brokerage of significant ranches, farms and recreational properties throughout the Rocky Mountain West. This Offering is based on information believed to be correct; however, it is subject to errors, omissions, prior sale and change or withdrawal without notice. Information contained herein has been provided by the Seller or obtained from other sources deemed reliable. The Agent does not, however, guarantee accuracy and recommends that any Prospective Buyer conduct an independent investigation. A 48-hour notice is requested to make proper arrangements for an inspection of Bostwick Canyon Estate.